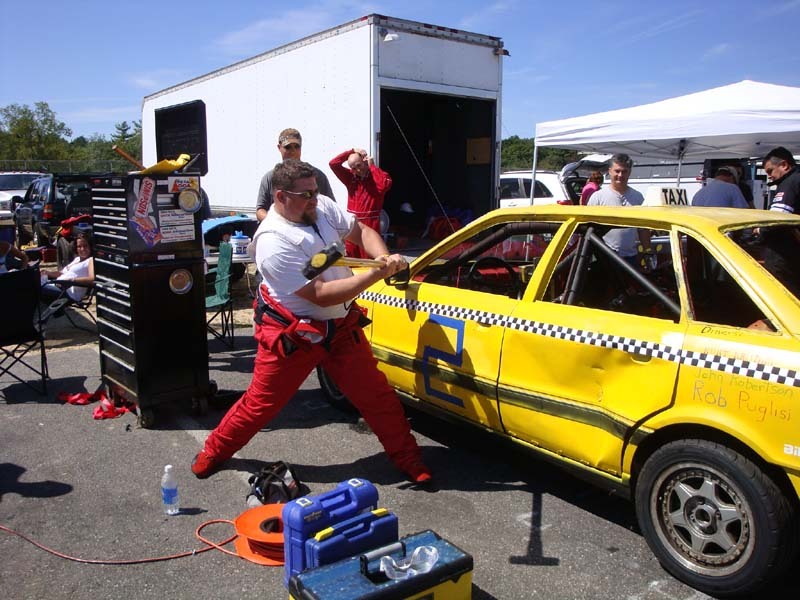 If you've ever been to a 24 Hours of LeMons or ChumpCar World Series event east of the Great Plains, you likely have run across Schumacher Taxi Service. The Philadelphia-area team has campaigned as many as three cars at some events. They've also towed their heaps as far as Gingerman Raceway in southwest Michigan and Sebring International Raceway in central Florida to crusade for crapcan glory. Of course, it's difficult to describe the Taxi Service as a single team; because of team members' spread-out home locations, there are actually two build teams and a roster of fill-in drivers. One team (Rob Leone, Dave Heinig, Mike Burg, and Kurt Krumm) recently inaugurated a "new" car, a BMW E30. 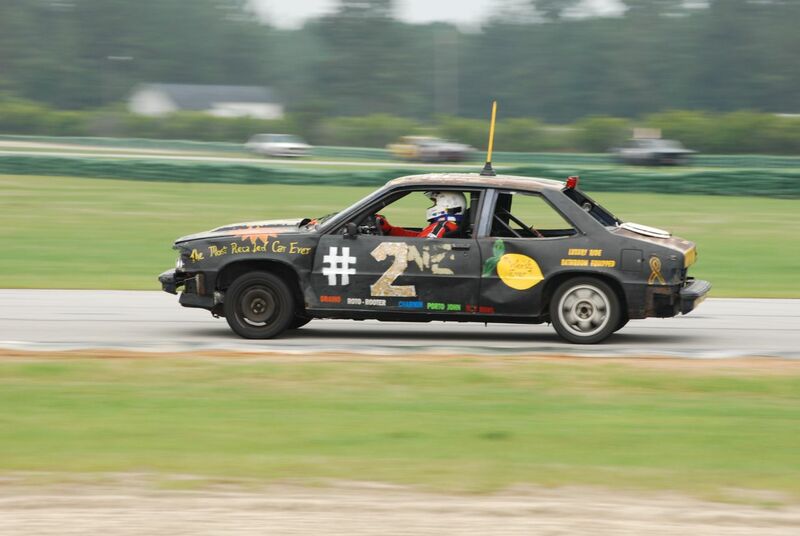 A second team (Jer Enger, John Robertson, Dave Hughes, and Justin Hughes) flogs the venerable Toyota CoROLLa (so-named for surviving a rollover mostly unscathed). Drivers Lori Leone, Scott Boito, and Mark Labbantz fill out the rosters when needed. Of course, the teams occasionally swap spots in each others' cars and employ the help of several friends, so this list is necessarily incomplete. Their long and storied crapcan career, like any other racing team, includes failures of varying magnitudes. But Schumacher Taxi Service's many successes include an Index of Effluency win in LeMons with a Chevrolet Citation X-11 and an overall win on laps in ChumpCar at the illustrious Sebring International Raceway with the CoROLLa. The Rusty Hub caught up with the Schumacher Taxi Service's Rob Leone just two days after the team had run two cars at a LeMons race at New Jersey Motorsports Park. 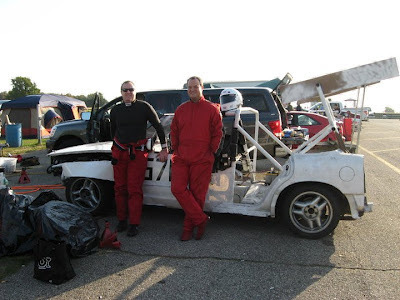 We discussed a small cross-section of the team's experiences, which include (but are not limited to) spectacular engine seizures, the psychology of a chassis-less race car, fires [lots of them], and Juggaloes. The Rusty Hub: Hey Rob, how are you doing? Rob Leone: I’m doing good. We’re tired from the weekend, obviously. You guys finished third [at NJMP]. Why don’t you tell me a little about what happened? Well, the third-place team is our Team 2 builders. They are always out for top finishes. They had a really good weekend. They got in the car, they started driving it, they didn’t have a single problem all weekend. They obviously finished third; they just weren’t putting the lap times in, but they stayed out there the whole time and they got it done. Was that the CoROLLa? You guys run an E30 also, right? Yeah, that was the CoROLLa. That car has now seen 12 races, which is absolutely unheard of. It is the most-run car or in the top 3 in the nation. How many races total have you guys been to? I was just browsing the website and it looked like you had at least 14 or something like that. I think I’m looking at 13 or 14. And Jer, on the other team, he was doing 6 or 7 this year alone. He’s been doing it since the beginning, so he’s up to at least 20 or something. Well, the whole idea of it is a little insane, at least. So why crapcan racing? How did you end up doing this? What was the chronology or decision-making process that led to this? At the time, Dave Heinig and I had already bought a car for like $450 that we cared absolutely nothing about. The idea was to rallycross it and beat the living daylights out of it at any event we could and just drive the thing into the ground. So we looked at each other and said, “We have a car ready. Just needs a cage." And that car happened to be the CoROLLa. 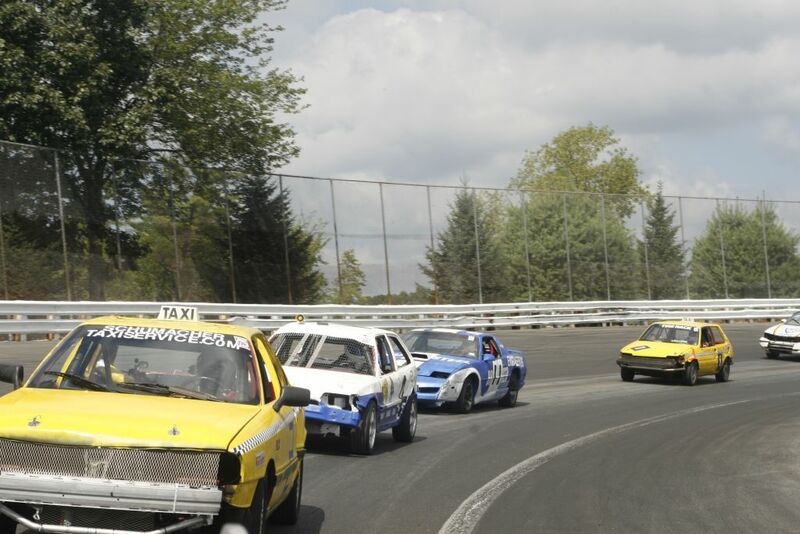 That was the inaugural race; we had planned on going up to Stafford Springs that year. Then things happened and the car was ready, so we said, “You know, [the race at Carolina Motorsports Park] is happening. Why don’t we head down there? And that was the inaugural race. It was me, Dave, Lou [STS driver Luis Gomez], and Kurt [Krumm] that drove down there. From what I read, you guys ran into what most teams seem to run into in their first race, which is just a string of disasters. That one wasn’t as bad as it could have been. I think we were out for a couple hours...I remember breaking a wheel stud. We had a very light car with excellent brakes and that’s what we did. So we went out there, I think...we had lots of little things go wrong. We had a fuel line leak. I know one of our drivers had a small incident on track; he hit another car and ended up getting black flagged for that and then got tarred and feathered. Well, the problem is that, through the years, everybody has put a lot of money into things. It’s why they don’t do the [People's Curse] anymore. Everyone is showing up with cool suits and you’ve got money in your gear now. So they don’t put the Karo syrup on you anymore to do the tar and feathering. And that’s why they stopped messing with people’s cars as much. They had a penalty, the Sands of Time, where they dump a bunch of sand into your intake and had you drive around for a bit. It is a cruel penalty. But you know, guys are putting lots of money into it, so guys are...not complaining...but just, “I’ll take the hour penalty” or whatever. I don’t think they do the Grill of Damocles much either anymore. They do, but there’s a lot better driving now. There isn’t as much bumping. People who get it, get it. They’re not going to go out there and bump draft. They know better. One interesting thing I noticed when perusing the site was, in the CoROLLa build thread, a common theme throughout. And that was the sentence “Rob set the car on fire.” Was that just welding stuff that ended up catching on fire. What’s the story there? Yeah, typically welding stuff. You catch the sound deadening on fire. At one point, we had a nice fire going. It caught some soundproofing in the door on fire. It got to be so commonplace that it was just a deadpan statement: “Car’s on fire.” At that point, everybody knew, it could be raging. We had a new guy come and he was working. Typically, I’m in the car, I’m at some weird angle welding and I say, “Hey John, car’s on fire.” “OK.” He doesn’t do anything. So I said, “Car’s on Fire.” He said, “OK.” I don’t know if he thought I was joking or what. I finally screamed at him. At that point, the door’s going up and there’s three-foot flames coming out of the door. [Laughs] The door’s open, so we’re not burning anything important; we just have a fire. Since I’m the designated welder, I’m always the guy who catches stuff on fire. It also helps that I have a really nice oxyacetylene rig that can cut through a half-inch of steel if we ever needed it to. That gets broken out if we have anything we can’t get through with the Sawzall or the grind wheel. I’ll just get the torch. Oh yeah, that was totally me. I’m always the guy on the forums and looking around. I don’t want to say we’re one of the better teams; we’re one of the more-known teams. And that comes from always calling people and always talking to them. So we happened on this engine. And, of course, I get to the guy’s house, events happen...and I’m looking at this woman sitting on the porch and thinking, “That’s not the guy’s mother. I wonder who that is.” And I’m a meat and potatoes guy; it didn’t occur to me what was going. Then all of a sudden wheels started turning and I’m like “Oh..."
[Laughs] That’s fantastic. I would be at a loss there. How do you play that off? I’m sure [LeMons Supreme Court Judge Phil Greden, aka Murilee Martin] would appreciate that story. Were you part of the Citation build? Yeah. Both of them, as a matter of fact. Well, that was one of Jer’s neighbors. The guy had the car sitting out by the side of his house for months and months, if not years. This was back when we were starting. So Jer started looking and noticed, “Hey, that’s an X-11. Hey, that’s a High Output engine.” And this thing progressed from there. I ended up on the original build team. You can’t imagine in your wildest nightmares how rusty this car was. The first time we drove it and we took it out to a [SCCA] Solo event, I was sitting in the passenger seat and Jer guns the engine. I end up in the back seat because my seat came off of the floor. It had rusted off the floor. Jer looks over at me and asks if I’m OK, and I say, “Yeah! Keep going!” [Laughs] So that’s where that car started. And it went downhilll from there. We tested the High Output engine by letting it idle to see if it would overheat. Obviously, it didn’t. We took it out to the first event and we broke down on the outlaps. They start you under yellow and we broke down there. That sounds about right for a Citation. [Laughs] Do you want to hear the end of that story? Because it gets better. So we get it started again and we start circulating. We are absolutely not going fast. We come in and we can see oil leaking out of the head. The head gasket’s blown; it’s blown beyond belief and we can see the oil just weeping, just coming out. We’re overheating and we’re like 10 laps into the race. Jer goes to me “I’ve had it with this car; I’m getting out.” And I go, “Well, I’ll drive it. I’ll see what’s wrong with it.” And Jer leans in and says to me, “Rob, I don’t want to see this car again unless it’s on the back of a flatbed.” I can arrange that. Yeah, until you’re in the middle of traffic going, “Please don’t hurt me!” We’re technically...Dave is an engineer, I grew up racing, the Hughes before this raced jetskis. We’re all coming from a motorsports/engineering background. So none of this is “Oh, you can’t do that." It’s “How can we do it?” And that’s how we ended up with the Crown Vic. Why don’t you tell that story? That car is something to behold. A Mark VII, yeah. And he’s a friend of mine anyway from racing. He drives by and we’re like, “We can do THAT. We can do that to the Nth degree. What cars were chassis-on-frame that we can just take the chassis off?" And that was the conversation that started with. And we realized Crown Vics: chassis on frame, big 4.6-liter engines; they are indestructible. You get the cop one with the P71 chassis and you can beat the thing and it won’t die. And we found one. It had been sitting in a lake, in a puddle. The undercarriage was rotted, all the brake lines were rotted, all the fuel lines were rotted. So we got it cheap. And we had two Sawzalls and a plasma cutter and we went to town. We took a 4,500-pound Crown Vic down to an actual weight, before we put a cage in it, of 2,500 pounds. We got to sell all that for scrap and got back like $200. We had a $400 car with $200 in scrap, so we could do some stuff. We got to put shocks and stuff on it. How was it to drive? It wasn’t too bad. The engine wasn’t strong on it, so it’s not like we could pull on people. The handling wasn’t too bad; we had a huge 4’ x 6’ wing on the back. It took three guys two days to make and it actually worked. We had a nice bit of downforce, so the back stayed planted. You’ll see in the pictures it says “Gas Tank” on the back. Halfway through the build, we realized we had taken all the crash structure off the back. So that is the gas tank sitting literally six inches from the back. If we got hit in the back, we would have been a literal flaming wreck. Is that why LeMons put in the crash structure rules? You guys are the reason for that? Yeah. Jay let us through. He literally asked us, “How far did you guys drive?” “500 miles from Philly.” He’s like, “Alright. You guys can race, but the ONLY reason I’m letting you race is because I know you, you’re smart and you’re not going to do anything stupid. But this is the last time I see this car.” So he put “must maintain original crash structure” in the rules after that. You guys won an Index of Effluency with the Citation. That is a mystery to me how you would do that at all. Well, you have to understand that they look for the unusual car and we had it. We took the engine with the head seized out of the car and, when we disassembled it, it was a spectacular seizure. Do you have pictures of the seizure? Anyway, we took the Craptation back. We already had a little bit of brake work and we knew it would run. It had a fuel cell in it, so we already had a bunch of work in it. And--the best way I’ll phrase this is--we “appropriated” a 2000 Grand Am...and pulled the engine out. GM, in their infinite wisdom, actually made the transmission mate to that block with no hardware, no nothing. It mated right up. Three of the four engine mounts were the same. The exhaust bolted in the same spot by the firewall. The thing just FIT. Perfect. Like it was meant to be there. So all of a sudden we had 200 horsepower in an early '80s...thing. And the only thing we needed to do was move the dashboard offset to the right a little because the wires wouldn’t reach. So we pulled the whole engine, harness, and everything out, put it in the Citation, and it ran. That race was one of the most fun races we’ve had. I can’t explain it real well; it was one of those things where you had to be there. But we went through eight sets of brake pads; the car originally came with 120 HP, we had 220. [Laughs] So we knew we’d burn through brake pads. We could out-accelerate any car out there. So we would come through a corner, get on the gas, and we would pass four people. And then we’d have to shut it down before the brake markers. Just come up off the gas, let it idle...idle...idle...and then you get on the brakes. And even then we were burning through brake pads. We knew it was time to come in for a driver change, because we’d have a spotter sitting in the beginning of [Turn] 1 and we’d watch for sparks coming from the brakes. We would run the car until the pad is gone and then we’d bring them in. And you’d do a driver and brake change? Yep. One of the drivers went a couple of laps after that. He came in and the brakes were on fire in our pit stall, in our paddock spot. We pulled the tire off--and we’re working with welder’s gloves--pulled the caliper off, pulled the rotor off. We’re looking at the caliper and the piston falls out of the caliper. Brake fluid starts leaking through it and it’s on fire. So we have a puddle, a lake, of flaming brake fluid in our paddock spot. We took the rotor and threw it in a five-gallon bucket full of water and the thing just kept boiling and boiling. It boiled for like a minute. If it wasn’t glowing, it sure was close when we brought it in. [Laughs] So, yeah, we ran through eight sets of brake pads. We had all the brake pads from every Autozone, Pep Boys in three counties. [Laughs] Yeah, where do you get Citation brake pads? Are they common with other cars? It was a common chassis, so it shared pads with a few cars, but you only keep one set in store. [Laughs] At the very end, Jer was going to take the checkers, but he ran out of brakes. So for the last hour of his stint, he was on a no-brake run. He’d go into [Turn] 1, wouldn’t hit the brakes but would just downshift, downshift, and we’d hear the car revving. We took the checkered, but the engine was toast after that. For some reason, when you said “puddle of flaming brake fluid,” I just had the phrase in my head “just like GM drew it up.” I don’t know why; it seems the Citation was destined to be surrounded by a puddle of flaming brake fluid or something. Just an aside.